One of the delights of Langkawi is that, while the beaches have all the juice shacks and bucket-and-spade shops you could wish for, much of the island remains completely wild. On Langkawi itself there are two “geoforest parks” of protected woodland, and there’s a third across the nearby islands of Pulau Tuba and Pulau Dayang Bunting. My children love animals, but we decided to avoid the Wildlife Park, the Crocodile Park, and the Underwater World in Pantai Cenang. The animals there are for the most part not native to the island, and are not kept in natural conditions; and I’ve had quite enough of visiting aquariums in China. It seemed unnecessary to pay money when there was so much natural wildlife around. We were staying in a chalet a mile or so from the beach, and even there we were virtually surrounded by rainforest. Most exciting for the kids was the family of monkeys which lived nearby, and often visited to chew on the delicious leaves of the hotel’s garden. The hotel owner would chase them off, as they damaged the roofs of the chalets by running along them, but my children loved to see them. 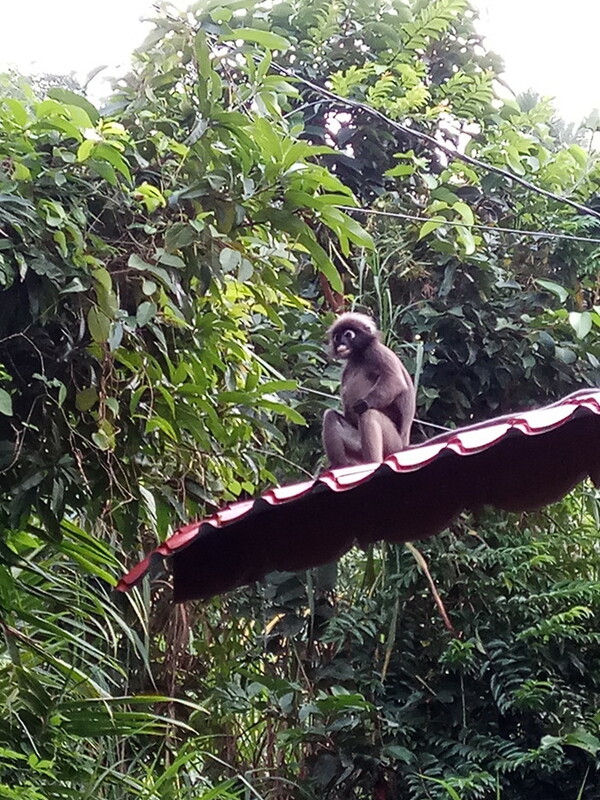 These were dusky leaf monkeys. The island’s other native species of monkey are macaques; larger, more fearless and more destructive. These primates are so used to humans that they would only move out of the way of our approaching car after much honking on our part, and much attitude and scowling on theirs. We watched a pack of macaques surround a picknicking family and steal their food in a coordinated attack – one would distract the humans while another moved in to grab anything they could. The macaques associate plastic bags with food. One of them charged hissing at my younger son, because it thought he might try to take away the bag of chili sauce it had fished out of a bin. I rapidly stopped finding them in any way cute or charming, especially after I saw an adult monkey punishing a juvenile by pulling its tail round a fence post until the little one was screaming in pain. If you see macaques, stay well clear, look after your plastic bags, and above all don’t feed them – they don’t need encouragement. If you’re really lucky you might also see the flying lemur, so called because it’s not a lemur and it doesn’t fly. In fact, it’s not even a primate, but a different branch of the evolutionary tree which now has only two surviving species, called colugo. The colugo has flaps of skin under its arms which enable it to glide from tree to tree. We weren’t fortunate enough to see one in the wild, but a guide on an excursion had one as a pet, and my children were fascinated by this rare, unusual (and extremely cute) little beast. Even more spectacular than the mammals were the birds. The common myna turned out to be common indeed, as we saw it everywhere, but we also spotted sunbirds, egrets, orioles and kingfishers. 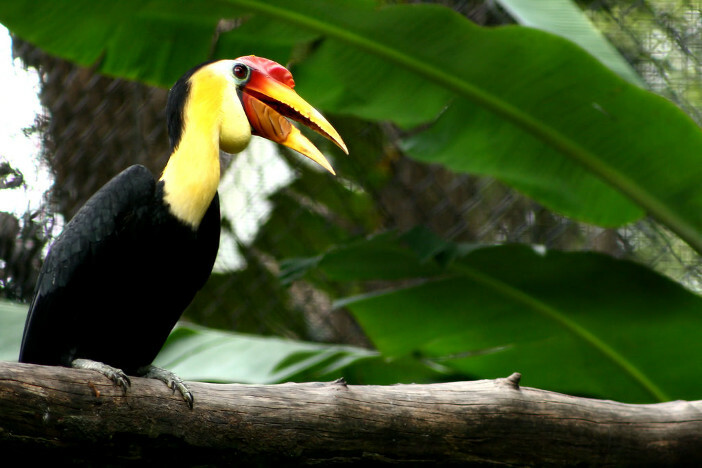 The Great Hornbill is the national bird of Malaysia, and it was a thrill to observe one perching in a tree near our chalet. Langkawi meanwhile takes its name from the Brahminy Kite, which could often be seen soaring above, looking for prey. Geckos were everywhere, including in our rooms, as were some spectacularly large beetles. (Those who prefer a sanitised environment might decide that Langkawi isn’t for them.) Sadly the only snakes we saw were roadkill; apparently the tarmac retains the heat of the day, and the snakes creep out at night to enjoy the warmth, only to be crushed by the wheels of passing cars. However there is one animal common around Langkawi that you definitely don’t want to run into. Our encounter with that creature will be the subject of my next post.